He: Does it take you a long time to chop and stuff? He: What kind of knife are you using? Me: Umm… a steak knife type thing? He: A steak knife??? No wonder you hate cooking! I’d hate it too if I were cutting with a steak knife! Me: What do you mean? What do you chop with? What else is there? And this was when Roy introduced me to the scintillating world of fine cutlery. When he explained that some knives made it so that one needn’t saw at food to cut it, I was blown away. I had been sawing food up for so long that I just couldn’t imagine cutting any other way. Because his carbonara recipe didn’t fail me, I decided to trust him on this. I thought about it for a number of weeks, deciding between the different brands. Today I finally took the plunge and bought my first nice knife, a Global 7″ hollow-ground Santoku. I tested it out while cooking dinner tonight, and as promised in the countless reviews I had read, it cut like a dream. Plus, on the back of the box, the Global makers liken the knife to that of a samurai sword, so it definitely helps that it makes you feel like you are a great warrior taking care of business as you chop up your vegetables. Feeling like Giada right about now, minus the cute outfit and exceptionally manicured nails. 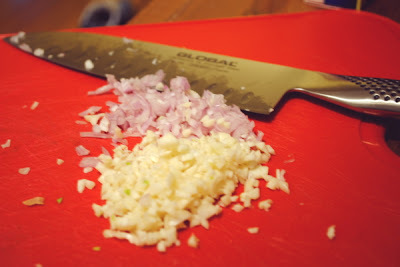 The most beautiful, finely chopped garlic and scallions I have ever chopped myself in less than 10 minutes. glad you have discovered good knives, they really do make all the difference in the world! everyone should have a 'warrior' moment in the kitchen! I just let mine get so blunt – my mum sharpens them every time she visits but if there is a large gap between I've been known to use the bread knife to saw everything….it does make all the difference having a good, sharp knife. Enjoy! Oo I love my Santoku!! My hubby and I were too concerned about our knives to entrust it to a wedding registry, so we bought them ourselves a few months ahead of the wedding, and it's the best kitchen purchase I have ever made. Well, next to the French press. Regardless, it drives me nuts to cook at other peoples' houses without my knives! I could stand to make coffee with other people's French presses though. I use steak knives, too. Maybe it's time for an upgrade. I was actually looking at new knives this past weekend myself. The good ones can get so expensive. I was doing the same thing for a few years myself. My knives we so dull they barely cut bread!!! My Mom bought me a few good ones for Xmas and now I'm chop-tastic!! Need something chopped? Huzzah – done! I love it. 2busy, I must say, I didn't buy into the nice knife hoopla either, but oh my gosh, really, it's like I want to go home to start cooking just so I can chop with my new knife. I highly recommend it! 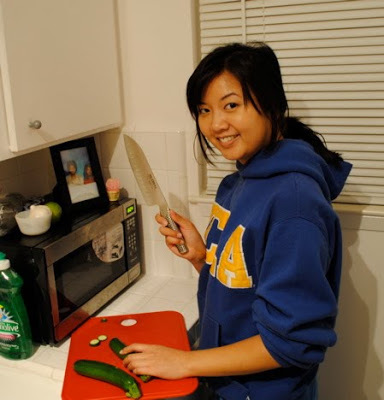 Give a girl a good kitchen knife and her cooking improves 100%. I picked up a small "scanpan" utility knife the other day and we are inseperable. cutting with a STEAK KNIFE?!? god bless your friend for showing you the way! Hee hee! Awesome. I still subscribe to the theory there are two things needed for a good cook, a sharp knife (complete with in-built samurai moment) and a good heavy bottomed frying pan! You just went from a 1991 used Honda Civic to a 2010 Lexus IS250.